City plan of Nairobi, Kenya's capital and largest city. Map and Guide of Nairobi. This is an uncommon map or plan of the city of Nairobi in Kenya, Africa. Surrounded by advertisements by local businesses, the map covers the capital city of Kenya from the Golf Course near Ngong Road north to the Karura Forest Reserve and from Eastleigh westward as far as Kilimani. Individual streets, parks, golf courses, railways, rivers, canals, etc. are noted throughout. 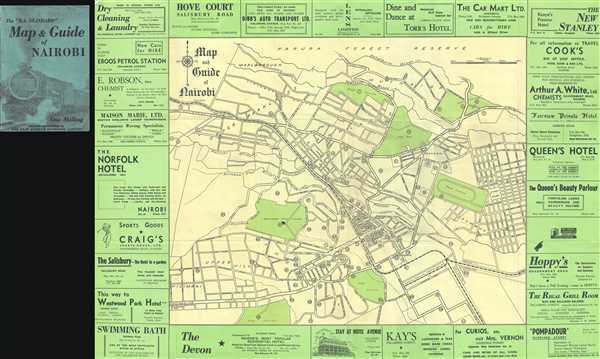 Verso of map includes a numerical index to the locations marked on the maps as well as other important tourist information. This map was copyrighted and published by East African Standard Limited. Very good. Minor wear along original fold lines. Attached to original binder.